Jatiya Sangsad (JS) Speaker Dr Shirin Sharmin Chaudhury has urged Qatar to invest in Bangladesh’s power sector. “Bangladesh has achieved tremendous success in electricity sector. Before the present government assumed office, the power generation was only 3,500 MW. Currently, the country’s power generation capacity reached 20,000 MW,” she told Qatar’s Shura Council Speaker Ahmad Bin Abdulla Bin Zaid Al-Mahmoud. The speaker had a meeting with her Qatari counterpart at Sheraton Convention Centre in Doha on Friday on the sidelines of the 140th Assembly of the Inter-Parliamentary Union (IPU) that is taking place in Doha on April 6-10. Dr. Shirin said Bangladesh’s environment is favourable for foreign investment and the government has established 100 special economic zones across the country to attract overseas investment. She urged Qatar to invest in one of the special economic zones, especially in medicine and ICT sectors. During the meeting, the two speakers held discussions on parliamentary democracy and economic and social development of Bangladesh. They also talked about strengthening bilateral relations among the two friendly countries. Mentioning to Qatar’s friendly relations with Bangladesh, Dr Shirin said exchange of experience among the parliament members of the two countries and bilateral visits will further strengthen the existing friendly relations. “Bangladesh under the leadership of Prime Minister Sheikh Hasina is now a role model of development. Once Bangladesh was a country of food deficit but now Bangladesh has been able to ensure food security by attaining sufficiency in food production,” she said. Shura Council Speaker Ahmad Bin Abdulla Bin Zaid Al-Mahmoud congratulated Sheikh Hasina for being the Prime Minister of Bangladesh for the fourth time. He praised the unprecedented progress made Bangladesh in social and economic fields. 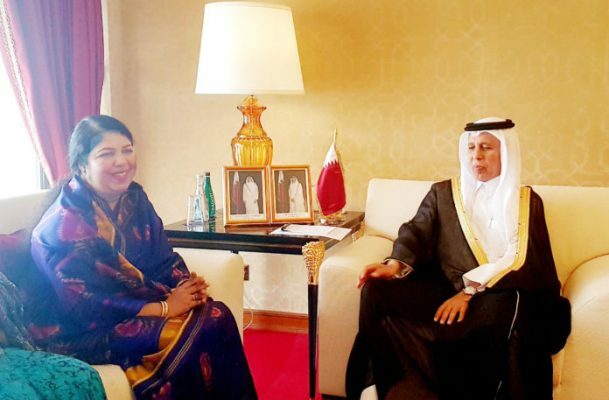 The Shura Council Speaker assured Dr Shirin Sharmin Chaudhury that Qatar would invest in Bangladesh to expand bilateral trade for mutual benefits of the two countries. Dr Shirin invited Ahmad Bin Abdulla Bin Zaid Al-Mahmoud to visit Bangladesh. Whip Mahbub Ara Begum Gini, Parliament Secretary Dr Zafar Ahmed Khan and Bangladesh Ambassador to Qatar Asud Ahmed, among others, were also present.